I had the pleasure of speaking at last night’s SQL Server Meetup in Glasgow. It was a fairly relaxed affair and I hope that the session was enjoyed by those who attended. I presented “A guide to SQL Server Replication, how to fix it when it breaks and alternatives to replication“. The slides are pitched at a basic level and don’t dive too deep into replication but give an overview of the different types of replication plus the key replication components. As promised, I have made the slides available for download. I also enjoyed doing the replication demo which worked but the content of that is not set out in a step by step fashion so I’ll work on that and aim to share it as soon as I get the chance. 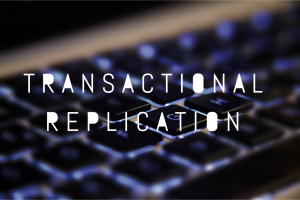 I focused the demo on setting up transactional replication and the importance of scripting it out so it is repeatable. I also showed how to use Replication monitor, how to use tracer tokens & how to query the distribution database for errors. There’s more info on that in this blog post. Thanks to all who attended and thanks to Robert French for hosting.